All along our nation’s eastern coastline, hurricane awareness is a way of life. On May 2nd, scientists at the Hurricane Genesis & Outlook Project released its North Atlantic storm forecast. They predict an “average to above average” hurricane season this year. Researchers at Colorado State also published their projections. On average, they say there is a 52 percent chance of a Category 3 or greater hurricane striking the Gulf or East Coasts. This year, they calculate a 63 percent chance of a major hurricane making landfall – 11 percentage points higher than average. Of course, a single storm can have a lasting impact if it strikes your neighborhood. Fortunately, there are many things you can do to mitigate storm risks. 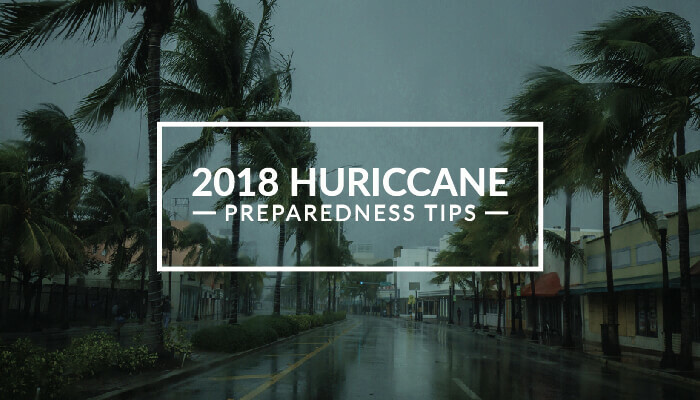 Here are 10 tips to help you prepare for the 2018 hurricane season. It is always wise to accumulate your important personal documents in one place so you can quickly grab them if you have to evacuate. It’s reassuring to know you have documents such as social security cards, homeowner’s insurance policy, passports, wills and deeds located and ready to go, preferably in a waterproof container. Maintain an inventory of personal possessions, along with photos, that could help you file an insurance claim. Add relevant medical information and pet records to your document folder as well. Although many refer to it as a first aid kit, it is really a mix of disaster supplies assembled in one place. Prepare your supplies with the assumption that cell phone coverage might be out or sporadic. In addition to an actual first aid kit, add maps, multiple flashlights, backup batteries, a battery-powered radio, lighters/matches and mobile device chargers. Have a three-day supply of non-perishable food and bottled water for everyone, including pets. Include a cooler with ice packs, manual can opener, personal hygiene items, blankets and waterproof clothing. Shield everything from moisture by storing the items in suitcases or plastic tubs. Add cash and medications as a storm approaches. In advance of a storm, secure or store loose objects that might become high-speed projectiles, like patio furniture, grills, and trash bins. Anchor portable propane tanks. Don’t overlook loose downspouts and drain pipes either. Cut down large branches that might pose a hazard in a bad storm. The term “rapid pressurization” sounds ominous because it can be. When intense winds breach door and window openings, soaring interior air pressure can literally push the roof off of a home. Therefore, shutter or board up windows and doors to avoid the potential for this catastrophic event. If you haven’t already done so, arrange to have your home retrofitted to limit potential hurricane damage. Wind uplift in hurricanes is a serious issue. Metal hurricane straps tie roof trusses and rafters to exterior walls, making them more resistant to wind uplift. Bracing an existing garage door is a surprisingly quick and inexpensive task. Or, consider an investment in a new hurricane-rated garage door. Insurers may even offer premium discounts. Although it is possible to install plywood over windows and doors every time storm warnings are posted, locating the plywood and installing it is time-consuming. Sometimes, a last-minute run on local plywood supplies makes it difficult to prepare for an impending storm. By comparison, pre-installed storm shutters are easily deployed in just minutes. Also, the insurer that carries your homeowner’s policy may lower your premium when you install Class A-rated storm shutters. When it comes to homeowner’s insurance, understand the distinction between actual cash value (ACV) and replacement cash value (RCV) coverage. For example, ACV coverage only pays for the depreciated value (less the deductible) of a roof replacement. A $20,000 roof installed 10 years ago may have a depreciated value of half that. ACV coverage pays the depreciated cost, (less deductible), while RCV insurance pays the entire replacement cost (less deductible) of home repairs. The ACV vs. RCV issue also applies to flood insurance. Ultimately, a homeowner needs to weigh the difference in insurance premiums vs. the risk. Sign up for emergency notifications sent out by local authorities via text and/or email. Search your community’s name and the word “alerts” to learn more. Ready.gov assembles crucial hurricane information and important links in one place. At the same time, back up important smartphone data offline so you can access without fail. Get updates via NOAA weather radio. During or immediately after a storm, register yourself as “safe and well” on a special website maintained by the American Red Cross. Before and during a storm, use social media to keep loved ones and friends informed of your plans. Provide updates if you evacuate or head to a shelter. Time identified Harvey as the first hurricane in which social media played a major role. Calls for assistance sometimes went viral, speeding the deployment of first responders. Storm shutters have come a long way in recent decades. They are more durable and easier to deploy than ever. A wide range of designs, shapes and colors make it simple to integrate them with your the exterior of your home. Palm Coast Shutters is your source for premium-quality storm shutters at wholesale prices. Shop our comprehensive online selection of storm shutters and related products, or contact us today for a free estimate.